At the age of 17, I saw Schindler’s List in the theater along with everyone else, and loved it along with everyone else. I have not revisited the Spielberg film since then, but I am highly suspicious of my affection for the picture, mainly because I saw it at a time when I was highly susceptible to commercial and critical hype. Two decades removed from the experience, Schindler’s List seems to embody everything that I reject in biopics and modern historical cine-texts, including the implicit assertion that the film is underline-important for merely existing. Moreover, Spielberg’s Best Picture winner continued Hollywood’s ugly tendency to tell stories of oppressed races, religions, and cultures through the lens of a (usually white) privileged class that allows freedom and dignity to exist. It’s even more vexing to consider that at the time, this perspective on the Jewish Holocaust was largely considered to be definitive, both historically and cinematically. 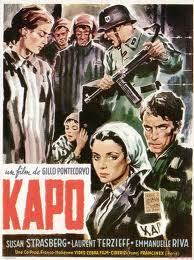 That ignores the long history of films from around the world that had already dealt with the brutal realities of the Holocaust, including Gillo Pontecorvo’s 1960 directorial debut Kapo. The protagonist of Kapo is not only a Jew, and one with a far more tortured and complex inner life than Liam Neeson’s Oskar Schindler, but also a young girl. 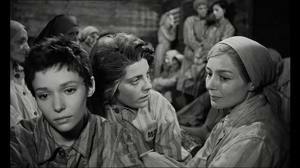 As the film opens, 14 year-old Edith (capably but not quite transcendently played by Susan Strasberg) is finishing up her music lessons, and as she puts on her jacket with the telltale gold star, assures her teacher that she will be “safe in Paris.” When she returns home, she sees that Nazis are loading her family into a truck, and she runs to join them rather than take her neighbor’s advice to flee. When Edith and her family arrive at the camp, they encounter the first of many brutal separation processes, as children are pried away from their parents. While Pontecorvo non-graphically treats the wanton murder and brutality at the camps with a queasy everyday-ness, the real horror in Kapo is in the “nightmare of selection,” a capricious and easily fudged balance sheet of life and death whose maintenance is often left to the prisoners themselves. Realizing the low value the Nazis place on them, the prisoners live in constant fear of inspection (never more so than when the Allies approach), and many try to exhibit a usefulness that too easily crosses over into collaboration. Edith escapes execution by relinquishing her name and religion and assuming the identity of a dead thief named Nicole – “If no one had died tonight, I couldn’t help you…” – and gets transferred to a work camp rather than perishing at Auschwitz alongside her parents. Since the former Nicole was a criminal, she immediately occupies the highest perch in the social order of concentration camp prisoners, with Jews occupying the lowest rung. Kapo exhibits a lot of the classic pitfalls of a first film, many of which Pontecorvo (who also directed Burn!, which Mike Dub reviewed as part of our Brando in the 1960s festival) would iron out in his follow-up picture, The Battle of Algiers – the intrusive musical score, the idolatry effect of Strasberg’s too-perfect tears, the abrupt romantic angle, and the weighty symbolism that occasionally lands with a crash. We didn’t need Nicole to suddenly obtain a black cat named Faust to understand that she had struck a Faust-ian bargain with the Nazis. But the film, shot in gorgeously grainy black-and-white by cinematographer Alexasandar Sekulovic, also offers a clear-eyed look at savagery beget by savagery that stands in stark contrast to the shameless tear-jerking of films like Life is Beautiful, The Book Thief, and even Schindler’s List. In survive-at-all-costs mode, Nicole becomes first a whore for the Nazi guards and then a “kapo,” a sort of “house Nazi” who abuses and informs on her fellow prisoners in exchange for food and other favors. At its best, the film has the clear-eyed objectivity of a journalist, while still establishing a moral outrage. Pontecorvo was a Communist, and one of the chief concerns of Kapo is with the hardscrabble class order that exists in even the most dehumanizing circumstances. Without social strata, the prisoners are completely undefined as people, and Kapo seems to argue that class systems are both inherently evil and inherently human, much like inhumanity itself. *Tomorrow on ESFS, our monthly Criterion Collection reviews continue with Mike Dub’s take on the relatively obscure 1949 Jean-Pierre Melville drama Le Silence de la Mer.